In Anchorage we spend hundreds of thousands of dollars resurfacing trails, but as the recent trail bridge collapse evidences, we seem allergic to monitoring and analyzing what lies below the surface. Does that render the people of Anchorage superficial? Well, I will leave that to the politicians to sort out, but in the mean time any rational person might inquire about possible solutions. Most cracking in Anchorage trails can be differentiated on whether it is latitudinal or longitudinal. Longitudinal cracks, cracks largely parallel to the direction of the trail, produce what Anchorage bicyclists know as alligator cracks. They are almost universally produced as a result of a failure of the material upon which the the trail is paved. Latitudinal cracks, cracks that run across the trail, are almost universally the result of tree roots, though they can also appear as a result of poor design in elevation changes. As noted, the most widely adopted method to deflect roots may also contribute to an increase in longitudinal cracking, while most deflection is intended to push roots below the trail, which may still result in eventual damage to the trail. I am proposing an alternative that may offer broad benefits; the use of a trapezoidal utilidor. No, this is not a covert Maths lesson. To the left you will see an isosceles trapezoid. 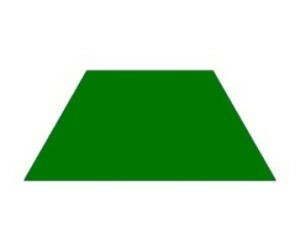 Note that the sides both angle up. This means that any the trapezoid will reflect up anything that approaches it. The result is an underground system that can be easily used to manage water (which is often problematic in Anchorage with the change in seasons) but can also be used to host things like fiber optic cabling. It is impervious to flora because roots are deflected to the surface (no threat of shallow or deep disruption of the trail) and based on its rigidity and its locking nature, puts an end to longitudinal cracking. Installation will be a bit more expensive as it will require removal of more material than has been the practice with use of crushed gravel, though the height of the trapezoid could be adjusted based on testing, development, and specific application. Yes, the initial costs would likely be greater than they are now, and yes, I have to acknowledge that Alaskans are typically allergic to investing in infrastructure, unless we are talking a bridge to nowhere, or a development that will raise the value of a politician’s investment, but if you are tired of whining about the poor condition of the traisl, and about being unable to use the trails every couple of years because they are in such a shambles, then maybe you should consider whether the folk in charge at present need an opportunity to work somewhere else?